David Cooper runs a restoration business in the quiet town of Bristol, Wisconsin, not very far north of Chicago. David always attends the Automotive Historians’ Dinner in Paris and made a very kind invitation for us to visit him during our ‘American Journey’. He has since become a member of the SAHB, and we are delighted to have his experience and expertise. David specialises in complete restorations of rare and valuable automobiles, especially pre-war and early post-war European sports and touring cars. To paraphrase David’s own words on his website, he is a passionate advocate of the importance of meticulous research, finding original historical documentation, and determining the original materials, chemistry, metallurgy, period production techniques and original specifications of the cars he restores – as well understanding the historical context and milieu in which the car was created. Here are some images from our visit, together with some information kindly provided by David as he described the cars. 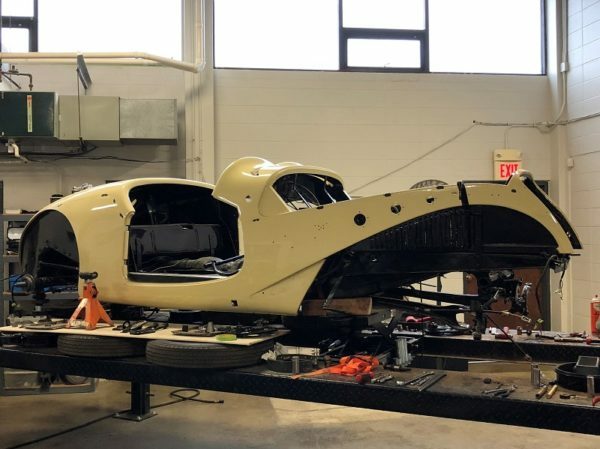 This Bugatti was undergoing a complete body and mechanical restoration. 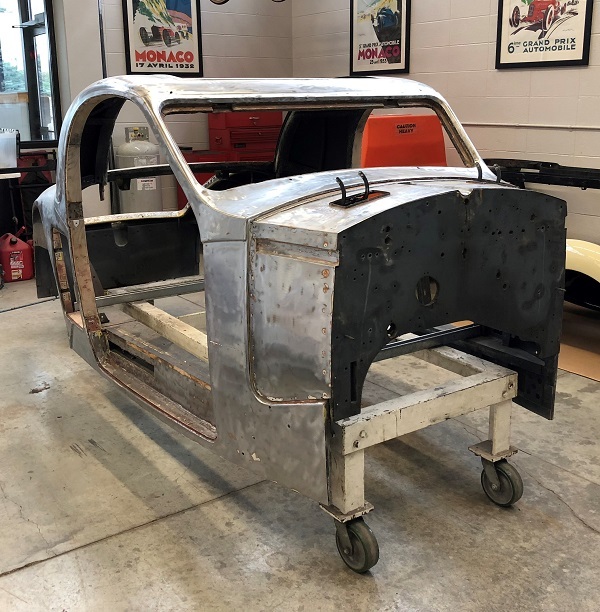 The body had been stripped back to the bare metal to reveal previous repairs and restorations, before extensive research to ensure the preservation of as much as possible of the original – which was, incidentally, in remarkably good order. Most of the wood structure was solid, thus allowing the original sheet metal to be retained – which would have been impossible if it had had to be unpeeled to repair the wood. David and his team have located the original engine and are re-installing it in the car. Here is another illustration of the preservation of originality wherever possible. 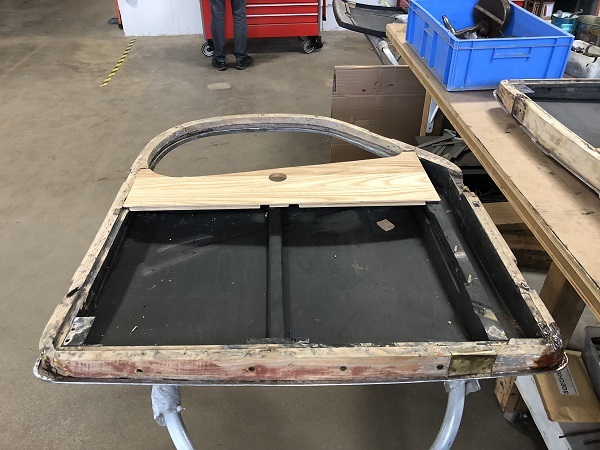 A new piece had to be inserted in the door: this new panel had to be solid as it holds the window regulator, and the original was rotted and splitting. But just visible on the top door rail is the original reference number that identifies the car. Mercifully, this was in good condition and did not need to be replaced. We had enormous difficulty in identifying the car in our title picture and here. 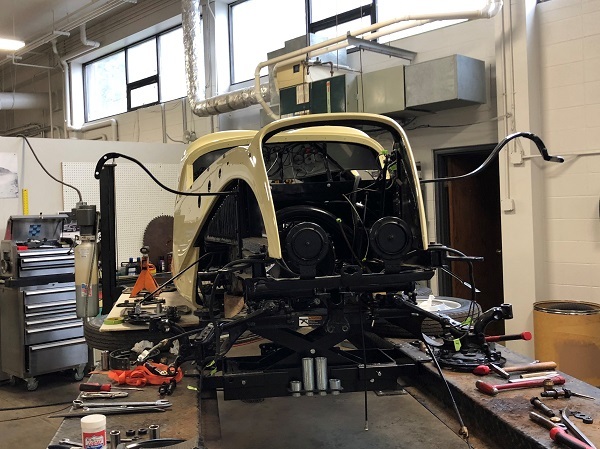 It was being restored to Cooper Technica’s exacting standards after a great deal of research into the precise components that should be on this particular car, based on its age and history. We did get the identification right after several minutes. Now we look at the pictures, it should not have been that difficult – but our excuse is that the car lacked radiator, engine, transmission, wheels, axles, steering wheel and interior. In a shameless and deliberate attempt to prompt comments to be sent to the SAHB website, we invite the very knowledgeable readers that we know are out there to tell us what it is. We expect that we shall get immediate and correct responses, but sadly we don’t offer prizes. Cooper Technica have rebuilt the steering all the way from the steering box, through all linkages, to the tie rod ends. The engine is being rebuilt, and the original shift lever to the rather special gearbox is being restored. And the Cooper Technica team are repainting the body to its colour when it raced in Great Britain: a French Blue in the correct original nitro-cellulose lacquer. Just to confirm that this car is not destined to hide in a heated garage on completion, it will be entered in a rally as soon as it is ready. This car wasn’t initially restored by Cooper Technica – but it is an excellent example of the standards the company works to. It was in for repair to a broken brake caliper and fitting of new bearings and seals in the rear hubs. These had not been installed correctly in the original restoration, and this was affecting the handling. 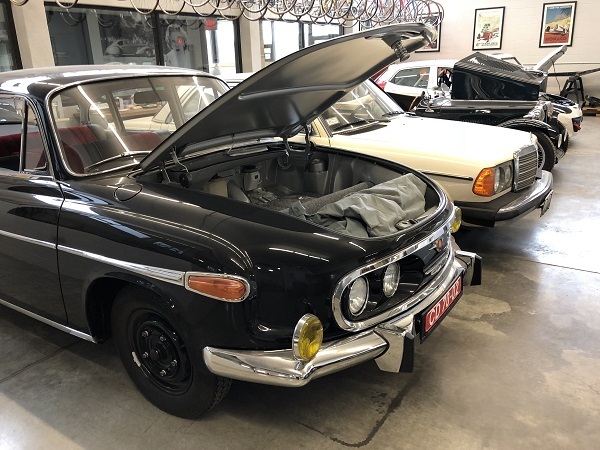 This car has a fascinating history: it was gifted by the East German government to Yasser Arafat and the newly-established PLO office in East Berlin; the CD plates on the car allowed PLO members in Berlin to move freely throughout Eastern and Western Europe on diplomatic business. This machine is one of only twelve or so thought still to exist in the world. At least three are in running order, and David has two of them. During the ‘Golden Age’ of coachbuilding before World War II all of the major French coachbuilders used one of these Crown Forming or Three-Olive machines. Unlike the English wheel used in Great Britain, this machine is powered. Aluminium or steel sheets are fed through the machine by hand, but the powered rollers (convex on top and concave below) function as a continuous former that that rolls or presses the part into the curved shape desired while it is being manually pulled through the machine. 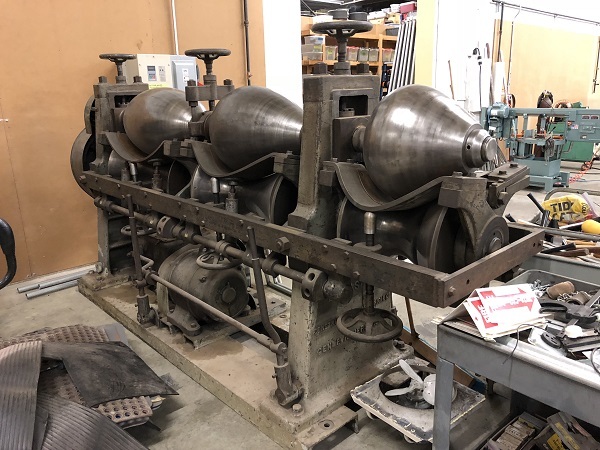 The machine still requires two highly-skilled craftsmen, who decide how to feed the sheet metal through to achieve the correct form, using one of the three different roller pairs. A panel can be fed through the Three-Olive machine repeatedly until the shape is correct – because, unlike the English wheel, this machine does not work-harden the piece. David has a second restoration shop in Lyon where they are restoring two Delage D8-120 Aérosport Coupes and a Delahaye 135M Saoutchik Cabriolet – all after extensive research into their history and the correct techniques required to return them to the condition and the operating perfection that they deserve. Perhaps one day we shall also be able to report on the work of the French wing of Cooper Technica, but for now we express our thanks to David for allowing us to show just a glimpse of the superb quality of the restoration that he carries out.